Posters are generally larger, more detailed and complex scenes which integrate slogans or catch phrases into the cartoon. Best viewed at a large size. A poster designed in conjunction with NetsafeNZ. The brief: public education about the dangers of internet scams. View detailed images of each phish species here. Licence this complete poster or as separate images. Illustrates the ramifications of a data breach. 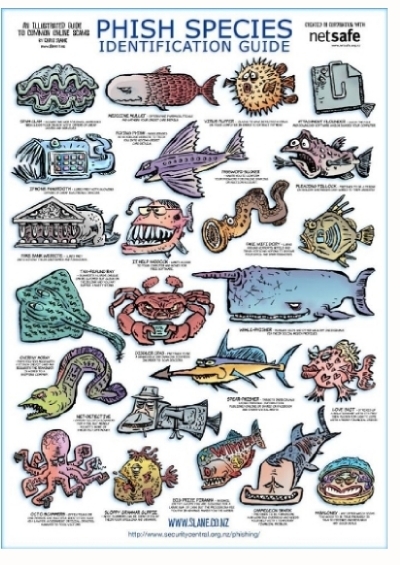 A series of cartoon posters commissioned by the Harbour Master, Bay of Plenty Regional Council. 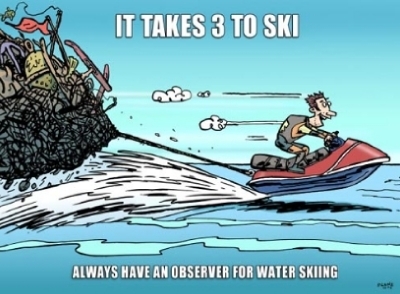 The brief: encourage jetski safety among young males with a series of cartoon posters. 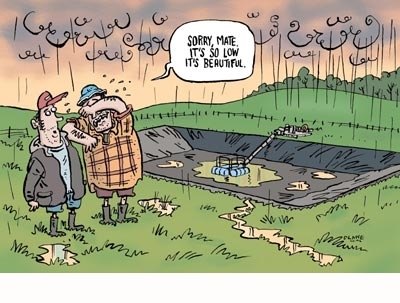 A series of cartoons were developed for DairyNZ Ltd as part of a campaign to change farmer attitudes so full storage ponds would be seen as 'high risk'. As a result of the campaign the level of significant non-compliance with council effluent rules fell. Cartoons formed a resource for advertising and for distribution alongside articles and releases to rural media. Sketches were pre-tested with farmer focus groups, then used in posters, calendars, fridge magnets, resource packs and their website. View Article. How to commission new posters.